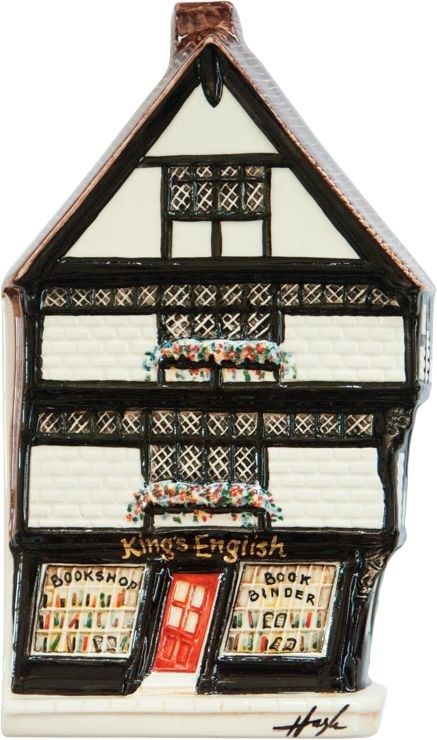 Some of them are names that are known the world over, others that we remember from our favourite High Street, all of these well known stores can be part of your personal street! When you have made your selection, visit our online shop to place your order. 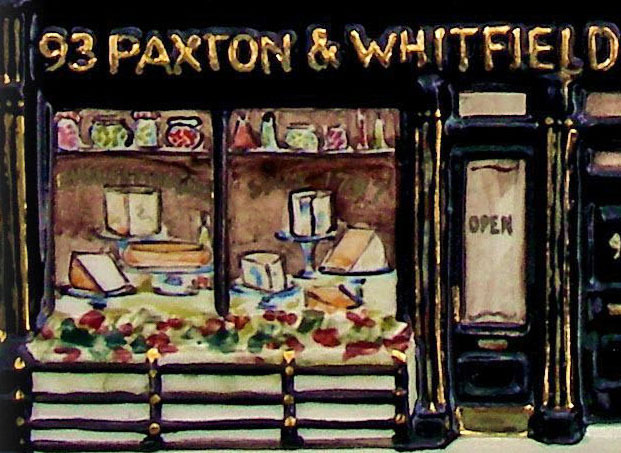 Located at 93, Jermyn Street, Paxton & Whitfield has been established in St James’s for over 200 years and in their present premises for over 100 years. Paxton and Whitfield were granted their first Royal Warrant by Queen Victoria, several more warrants followed, and today Paxton & Whitfield still supply cheese to our Royal Family. Take a closer look at the beautifully hand painted window on this ceramic, the cheeses stand on their platters, just ready to be tasted, and the name and details on the fascia and windows are painted in pure gold. Floris, the Perfumers, have been operating at 89 Jermyn Street since 1730. A delightful building & one of the many in Jermyn St. that Hazle would like to model. Note the gold & copper highlights. The interior contains some magnificent Spanish Mahogany Showcases from the Great Exhibition of 1851. One of the quirkier things that happened in the shop was the “laundering” of money. Because ladies of the period often wore long elegant gloves & money was quite dirty, Floris used to take the money they received from customers & wash & iron it. Change would be given to the customers on a velvet tray, still used today!! With service like this no wonder they hold Royal Warrants!! 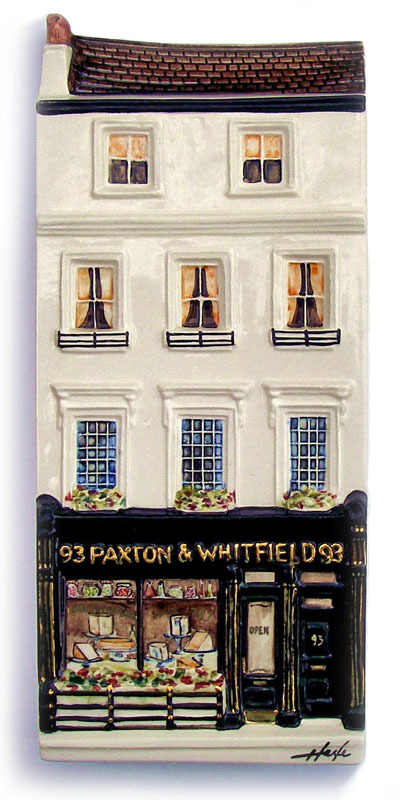 The building is directly opposite Princes Arcade, where you will find John English Gifts, one of our premier stockists & the shop where you can purchase this piece (as well as off the website) It is one of the smallest Limited Editions we have ever produced and is companion to Paxton & Whitfield, 2 doors away. Floris is a numbered edition of just 500 pieces, and measures 23cm (9″) tall to the top of the chimney x 10.5cm (4 & 1/4″) wide. Located at No. 6 St James’ London, Lock & Co. Hatters was founded in 1676 by George James Lock, and continues to trade as a Hatter from the same premises today. Over the centuries, Lock & Co. have supplied hats to the Military, the aristocracy, and more recently, celebrities. Their clients have included Lord Nelson, the Duke of Wellington, Frank Sinatra, Johnny Depp, and of course, many members of the Royal family. Lock & Co. where instrumental in the developement of the ‘Coke’ or Bowler hats, which at one time, no city gent would be seen without! 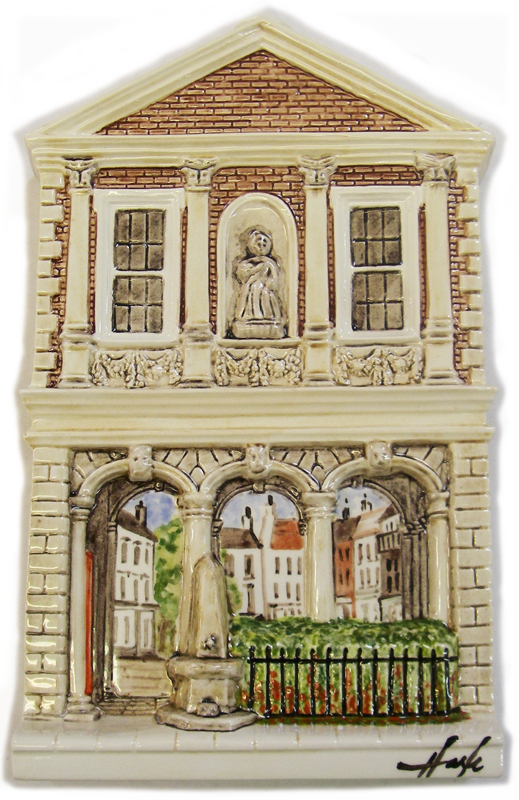 Our ceramic features a display of gents hats in one window, with ladies in the other, and the shop name in 22 ct gold. 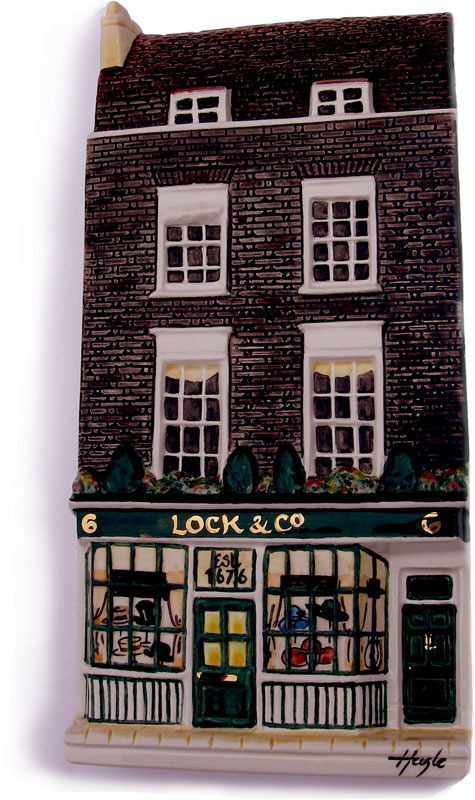 Lock & Co is a numbered edition of just 500 pieces and measures 21.5cm (8 &1/2″) tall to the top of the chimneyx10.2cm (4″) wide. 221b’ Baker Street ‘home’ of the celebrated (fictitious -honestly!) criminal investigator, Sherlock Holmes and trusty colleague Dr. Watson. 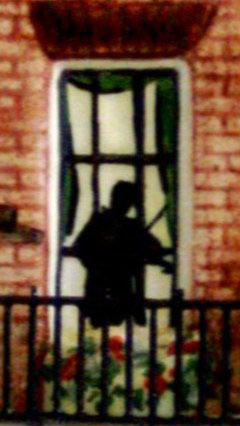 The ceramic is painted with Holmes playing the violin in the left hand upstairs window and his ‘hubble-bubble’ pipe in the right window. Mrs. Hudson’s (housekeeper) drawing room is on the ground floor. There are railings of cast metal and a metal lamp post. This is the first ceramic we have added metalwork to. The Sherlock Holmes House measures 23.4cm (9 & 1/4″) tall to the top of the chimney x 9cm ( 3 & 1/2″) wide. Ship’s governor Christopher Martin, a vitualler of ships, owned the Chantry building and lived there until he sailed on the Mayflower with the Pilgrim Fathers to New England. As vitualler, he also supplied the food for the voyage. Sadly, he perished along with his wife Marie, Solomon Prower, and John Langemore shortly after their arrival at Cape Cod, Massachusetts. The building has had many uses and changes of ownership over the years, and is currently a restaurant. 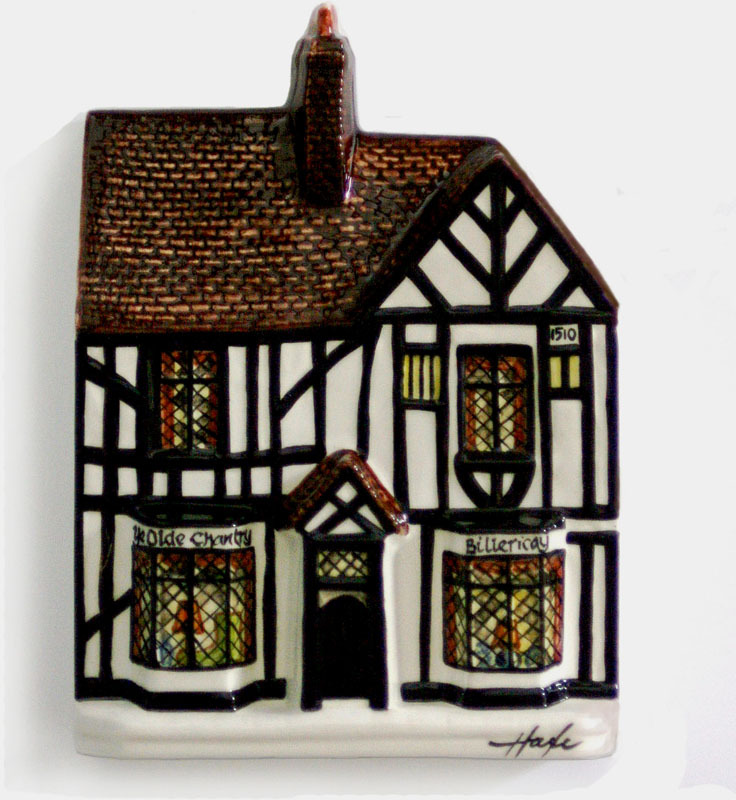 On the front of our ceramic version, you will see the date of building, 1510. Drive past the real Chantry in Billericay, and you will see a different date… Local historians advise the date we use is the correct one. The Chantry measures 16.9cm(6 & 3/4″) tall to the top of the chimney x 12.4cm (4 & 7/8″) wide. This elegant building is one of the most interesting that we have created! It was built between 1687 and 1689, by Sir Christopher Wren, who lived in Windsor as a child. The drinking fountain in front of the building was erected to mark Her Majesty’s Silver Jubilee in 1977. Another Queen’s Jubilee is commemorated close by, the statue of Queen Victoria was erected in 1887, to mark the 50th year of her reign. The Guildhall is a well known wedding venue, Prince Charles & Camilla Parker Bowles were married here in April 2005, and Sir Elton John tied the knot with David Furnish at the Guildhall in one of the very first civil partnership ceremonies. A limited painting of just 60 ceramics, each with it’s own informative certificate. The Windsor Guildhall measures 21cm tall x 12cm wide.